Jim K. amd 16 others enjoyed a good trip to Smithfield Canyon. 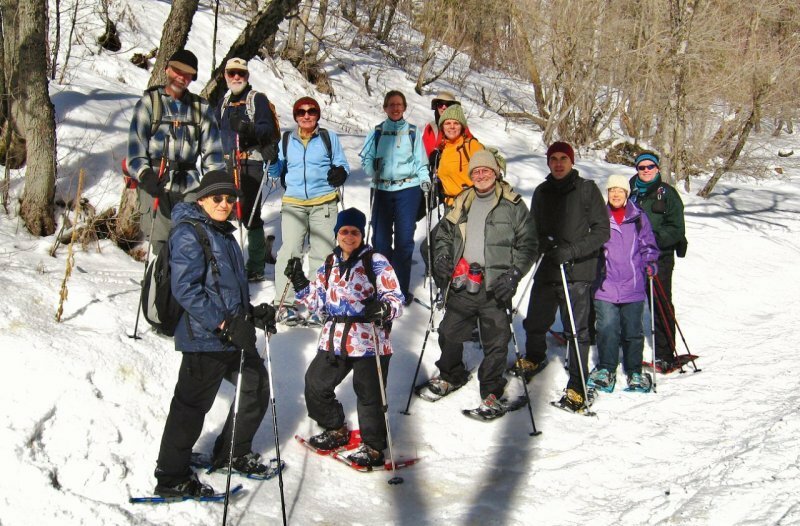 Dave P. and Jack were on skis, and Jim K, Dan, Carol, Heather, Sarah, Gordon, Rich, Kelly, Gustavo, Norma, Kyle, Tim, Jeanne, Monika, and Betty used snowshoes. Snow and weather conditions improved dramatically after the group left the shady lower canyon. The travelers separated into two smaller groups and used walkie-talkies to keep in touch. Gustavo, a visitor from Spain, had a good time chatting in Spanish with Heather, and Sarah entertained us with stories of her adventures hiking to remote areas in southern Utah to find historic rock writing by an ancestor. We had to push two stuck cars after our return to the icy parking area. This GPS track is from 2011, since we did not have a record for 2012.